Heirloom summer squash is available in countless variations and colors, from deep green, to yellow, to white, to combinations of all three. Our heirloom summer squash harnesses the sweet taste of summer and comes in all shapes, colors, and sizes. Of our sustainable, non-GMO heirloom summer squashes, zucchini is the one that you will recognize first. Zucchini has a firm and mild inner flesh that can be used raw or cooked. Yellow zucchini looks and tastes similarly to green zucchini, but is a bit sweeter (and yellow!). Straight neck yellow squash have creamy white flesh with larger seeds, and they can be used raw or cooked. Pattypan heirloom summer squash is shaped like small flying saucers and they are typically smaller and denser than other types. You can use them raw or cooked to enjoy their crunch. Baywater Farms offers heirloom summer squash in a mixed case, full of an array of our gorgeous heirloom summer squash varietals, and a ½ bushel box. Heirloom summer squash has a mild flavor that pairs well with cheeses, bright acidic sauces, and other vegetables. Summer squash can be used to make zucchini noodles, casseroles, fritters, or pitted like eggplant and stuffed with fillings. Zucchini and other types of heirloom summer squash grow quickly and pretty impressively (if you’ve ever tried your hand at it yourself, you’ll know what we’re talking about!). We harvest all of our summer squash so that they are 4-6 inches in length. While bigger pieces of heirloom summer squash might look more impressive, much of the flavor will be gone and the insides will be pulpy and seedy. Unlike fall squash, which have thick durable skins, summer heirloom squash has thin and edible skin. After harvesting, summer heirloom squash should be placed in the refrigerator for up to a week. For maximum flavor, use your squash as quickly as possible. 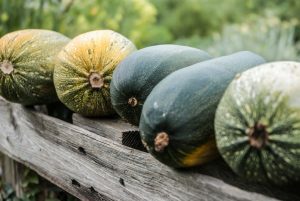 Baywater Farms is passionate about cultivating non-GMO, heirloom summer squash with love and care in the same soil that our great-grandparents tilled. On our sixth-generation family farm, all of our non-GMO and heirloom produce is grown using high-quality seeds that yield gorgeous, colorful, and delicious results. We use ecologically-friendly farming methods and are dedicated to preserving the provenance of our seeds, re-introducing historical crops, and supplying everyone in the area with locally grown produce with a conscience. You can find our fresh, non-GMO, sustainable heirloom summer squash in national grocery store chains, produce distribution companies, roadside farm stands, local farm-to-table restaurants, CSAs, and farmers’ markets. To learn more about ordering our fresh local produce, click here. Our excellent sustainably grown, non-GMO produce speaks for itself, and we know your taste buds will love to listen!